Online recharge portal Komparify now offer a first of its kind innovative service which help consumers to compare DTH packages and find the best package according to the need. 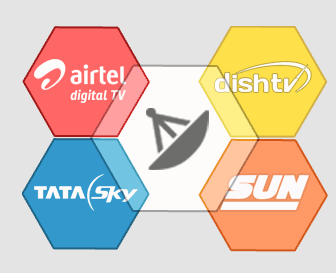 At last count there are more than 560 channels available across all DTH operators. An average consumer does not watch more than a few dozen channels. but each consumer watches a different set of channels from the other. The 6 DTH operators have offered a different bouquet of these channels sliced and diced into channel packages. Using Komparify search engine you can find a package which contains just the channels you watch. We show you results from all DTH providers and lets somebody identify the one that suits him/her the best and the one which suits their wallet the best. Using our side by side comparison feature you can easily identify which package has more bang for the buck and go for it. Due to compulsory digitization many users across India are shifting from cable to DTH Komparify can be the ideal tool to help consumers make that switch. After you identify the package that suits you best. As of now in India Komparify is the only portal which advises users on the right package and allows users to order DTH services online. I recharged with 43 rs for sms plan but i did’t got even single rupee simply got msg like recharge success in mobile but plan not activated waste fellows ..!.. @esmail…the reliance dth is talks in frm several years to sell dth busins to sun..and why u waiting ?? go witht a doubt with tata sky..mind blowing service within hrs..and packs are cheapest abt starting frm rs.170.. off topic-can u provide me reliance gsm 3g new prepaid mumbai packs deatail here?? i am nt able to view properly.. thaks.reply asap.